Our little flock of 10 love to welcome any wildlife intruders that enter our yard. Here, they are welcoming a cow moose that comes by weekly in the summer. Chickens Welcome Moose (and Bear): One day, I heard a lot of squawking, looked out my home office window, and there was the biggest black bear I've ever seen in the coop, eating out of the compost. 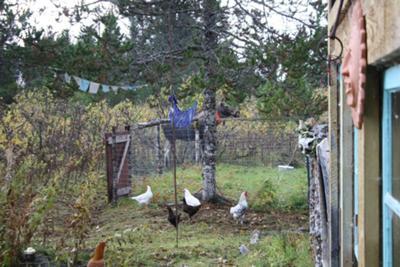 The chickens were headed straight to the coop to 'welcome' him. Or perhaps they thought it was me dropping off veggie scraps. Well, I had to shoot the shotgun in the air to scare the bruin off. But the chickens are just so curious. Join in and write your own page! It's easy to do. How? 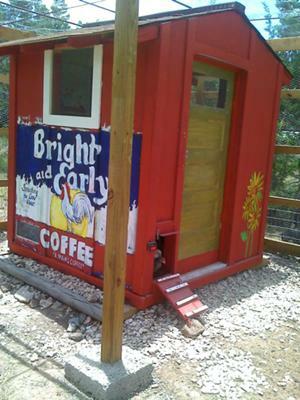 Simply click here to return to Your chicken coop photos. Chickens and Rosemary: Will rosemary -the herb- clippings hurt chicks? I have 10 girls, about two months old now. We live in central TX where deer eat about any and everything planted... except rosemary, so we have a lot of rosemary. It grows well, is wonderful for cooking, and smells divine, but it must be pruned back on occasion. I wanted to throw the clippings into the hen house with their pine shavings. Will they eat it or be harmed by having it in with them? BTW, this is our first experience with chickens. 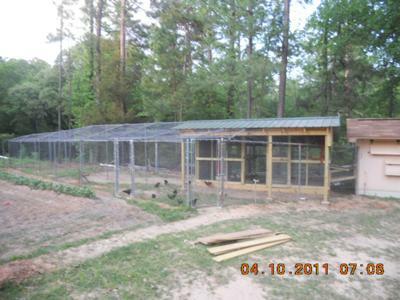 We just finished a 20 x 20 run and a 6 x 6 hen house. It is a fortress! A lot of work, but the ladies seem pleased. Usually chickens find herbs such as rosemary to strong to eat. If they do eat them there should be no problems. I saw this and had to show this to somebody. 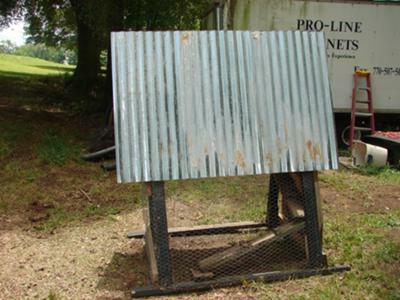 This is a half built chicken tractor. I know it's ugly but I guess it will work. 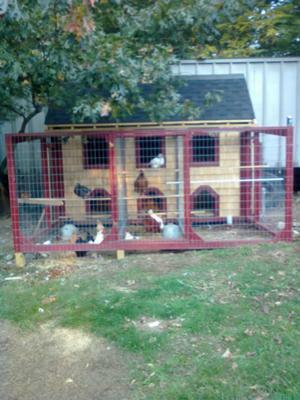 Brand New Coop: Built a brand new coop at our new house. I bought a bank foreclosure and redid the whole thing, interior and exterior. 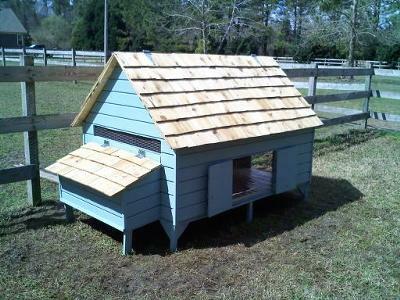 The coop turned out beautiful and I wanted to share. Response: Thanks for Sharing! It looks great! 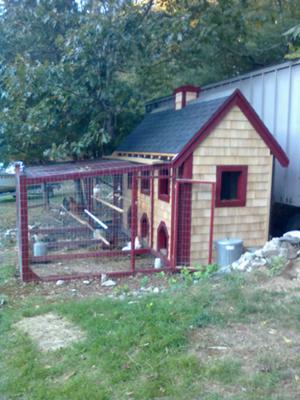 Chickens safe and secure: I built this coop solid so it will last for years. The run is 9x16 covered with one half inch hardware cloth not one hole bigger than one half inch. 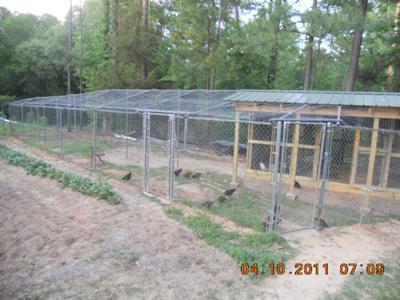 The yard is covered with two inch poultry wire to keep out the hawks. I buried one foot of welded wire all around the yard and the run as well. The perimeter of the run is lined with a row of concrete blocks and filled with sand over a full layer of bricks on the entire floor, if anything gets in there he is really going to have to work hard. Nice coop and run, good job! 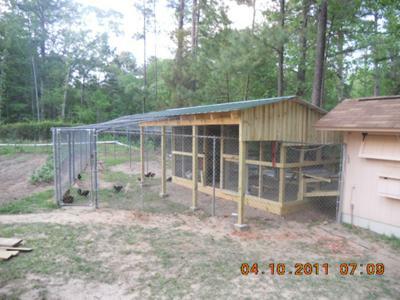 Built My Own Chicken Coop: When I decided to start raising chickens in the spring of 2009, I started looking around at pre-made coops (too expensive), coop kits (too much work for the cost) and coop plans (some good, some not, but nothing exactly what I wanted). 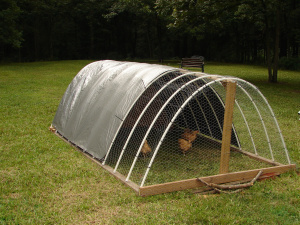 So I designed and built my own 4'x6' coop, large enough for probably 15 chickens. 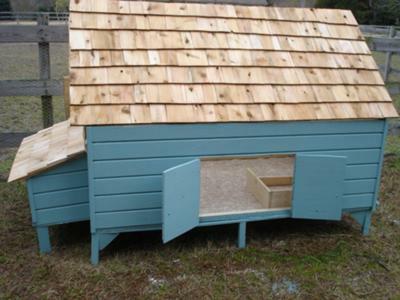 Using only a circular saw, jigsaw, drill and hammer, I built my coop over the course of two weekends. Then I wrote the plans up, added some progress photos and have been selling the plans on ebay every since. I've sold almost 200 sets of plans - and have lots of satisfied customers ! 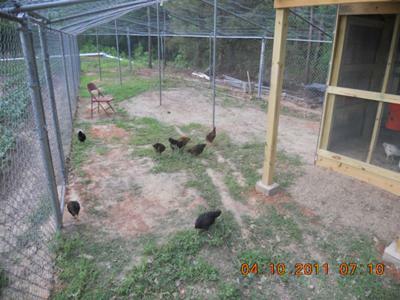 Simple chicken coop: Funds were limited, and I really wanted my own flock of chickens. 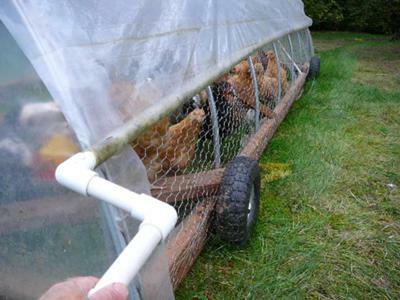 I had some PVC pipe left over from a job and used it to build a chicken tractor. It took me about six hours to build and since I had 90 percent of all the material it only cost me 10 dollars. Best investment I ever made. Having your own chickens is the best therapy in the world. 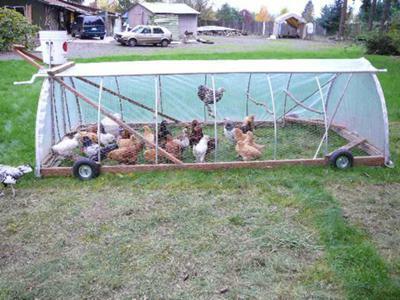 Greenhouse chicken tractor: We live in southwest Washington state where it can rain a lot. We tried all wood designs at first but by mid winter they would become too heavy to move. 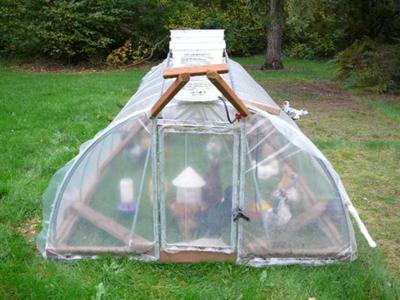 We got this idea from covering our garden crops using modern greenhouse materials. It's light, easy to move, clean and easy to regulate the inside climate. 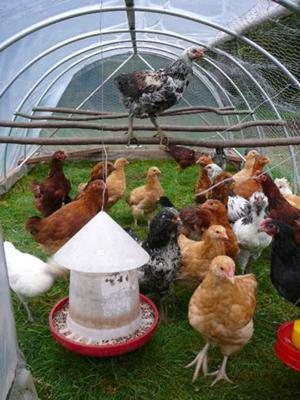 It handles 25 birds well and since it's so light and airy inside of it (we assume) the birds hang out better together. We put the birds in at one to two weeks old and hang a hover bater type brooder until they get there feathers.